One of the major causes of car accidents in the US are animals. Whether a deer totals your car or a squirrel causes you to swerve into a ditch, there are numerous types of animal-related accidents. There are also important things to keep in mind when you are involved in an accident with an animal. You should always pull over to the side of the road and check to make sure if everyone is okay. This is standard protocol after any accident. The Esurance website also suggests setting up flares or road triangles to warn other drivers. 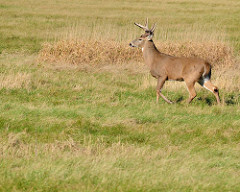 Deer and other animals often travel in herds, so multiple and consecutive accidents are not uncommon. Next, call the police. This is also mandatory after virtually every accident. In fact, fleeing the scene after you hit an animal is a serious offense in most states, which can lead to fines and other penalties. Document the crash with your phone if possible to corroborate the police report—something you can use for an insurance claim down the road. Finally, keep an eye on the animal, especially if it is still alive. Most animals become violent when injured, so try and keep your distance. If you have small children, keep them in a safe area as well. Animals are most active during dusk and dawn, so always keep an eye out while driving during these times. When you’re going on a family vacation, there can be a thin line between a great trip and a catastrophe. That’s why it’s especially important to take the right vehicle, an SUV like the Escape, Explorer, Edge, or Expedition. Each of these model has tons of storage, a comfortable interior, great entertainment options, and a fuel-sipping powertrain. Depending on the size of your family, you can select the right Ford model for you. You’ll always have room for bags, as well as plenty of space for seating. Ford models also come with great features for keeping the kids entertained. These include the advanced Ford SYNC with MyFord touch system, helping you to stay better entertained than ever before. Rear seat DVD systems are available, as well as integrated Wi-Fi and premium audio systems. Best of all, Ford models are renowned for their fuel economy. The Edge and Escape get up to 30 highway mpg, while the Explorer gets an impressive 28 highway mpg. Finally, the Expedition can get up to 21 mpg—incredible for a full-size SUV. It’s undeniable that Ford models are the best SUVs for vacation.